Pioneers in the industry, we offer aluminium co2 cylinders for soda maker, co2 aluminium cylinders for beverages, beverages aluminium cylinders and beverages cylinders from India. Al-can is India`s first manufacturer of Low Pressure Aluminum CO2 gas cylinders for beverages. You can enjoy real taste of beverages in aluminum cylinders as Aluminum Cylinders are corrosion resistance with CO2gas, light weight and easy to carry. While steel cylinders are prone to corrosion with CO2 gas as moisture in gas makes carbonic acid which reacts heavily with steel cylinders. 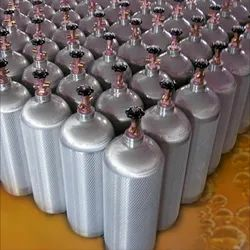 Al-can is India’s first manufacturer of High Pressure Aluminum CO2 gas cylinders for beverages. You can enjoy real taste of beverages in aluminum cylinders as Aluminum Cylinders are corrosion resistance with CO2gas, light weight and easy to carry. While steel cylinders are prone to corrosion with CO2 gas as moisture in gas makes carbonic acid which reacts heavily with steel cylinders. 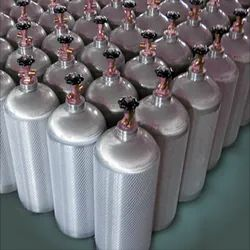 Al-can CO2 cylinders are use in other applications also CO2 cylinder is useful in Fish Tank to maintain greenery, in refrigeration to maintain cooling, in paintball game, in medical for laparoscopy surgery and in soda machine for soft drinks and beers. Packaging Details: SPECIFICATION WORKING CAPACITY 1.3 LTR W.C TO 23 LTR W.C. WORKING PRESSURE 126 BAR AND 150 BAR. STANDARD Cylinders are made strictly as per safety standards, assuring a consistent and stable performance. Approved by petroleum and explosive safety Oraganisation (PESO), Govt of india. ISO 7866 with ¿¿¿Pi¿¿¿ (¿¿) mark (TPED) and CE mark (PED) approved from Apragaz. MATERIAL Manufacture from High strength aluminum alloy 6061A. THREADS ISO 11363: Part II: IS 3224 1-125, 12UNF, 750-16 UNF 25E Thread & other threads available as per request. MARKINGS As per International Standard. Additional marking available upon request. FINISH Standard finish is brushed body with clear lacquered makes it elegant in look and neck color as per gas to be filled. GRAPHICS Logos or labels available upon request. FEATURES Seamless, Light Weight Cylinder (40% Lighter than steel cylinder). Easy to handle and transportation. Corrosion Resistant interior and exterior wall surface. Non-Magnetic. No Special Maintence required, only require requalification every five years.